This engine is very agricultural in appearance and design, but was the first engine that I designed from scratch and fabricated everything for (apart from the spark plug). The keyword is simple with an emphasis on designing something that would allow skills to be gained in machining cams, gears, valves and cylinder bores at the same time resulting in a working model. 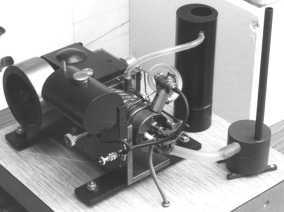 The basic scheme is a single cylinder four-stroke engine with a 1 inch bore and 1.25 inch stroke. The result is a capacity of 0.98 cubic inches or 16.1 cubic centimeters. 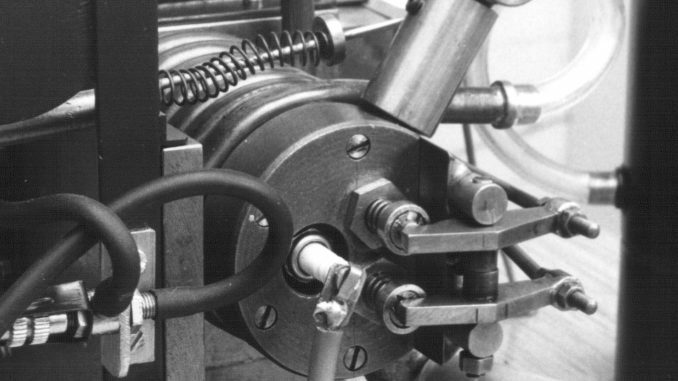 A horizontal layout was chosen as this allowed a simple crankcase to be fabricated from 1/4 inch flat mild steel sheet that was fixed together using countersunk bolts. The cylinder head was machined from a solid billet of cast iron. This was easy to work with the benefit of allowing the valve seats to be formed directly in the cylinder head without having to resort to inserts. The cam profile was kept simple for machining purposes. It was machined using a mill and an indexing head. For each angle around the cam the radial distance was calculated and from this the height of the mill set. The result was a set of cams that had a series (one-hundred and twenty in all) facets on the working surface. The facets were removed by carefully filing a smooth profile. 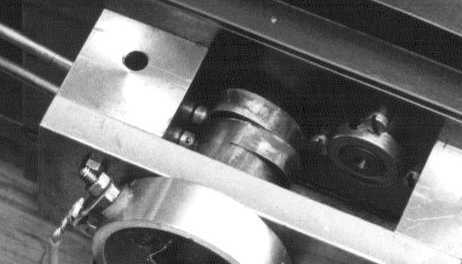 The inlet and exhaust cams were then parted to form the individual parts. These were then hardened. The cams were attached to the main camshaft using small grub screws to allow the timing to be adjusted. The cylinder was machined from mild steel and this bolts onto the crankcase and the head bolts onto the cylinder. 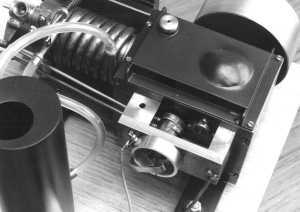 The copper pipe was wound around the cylinder to form the cooling jacket. The engine runs as it looks, very agricultural and with quite a lot of vibration. Not many calculations were made when planning this engine, but I was around 16 years old and that was many years ago. More designs in the gallery page.